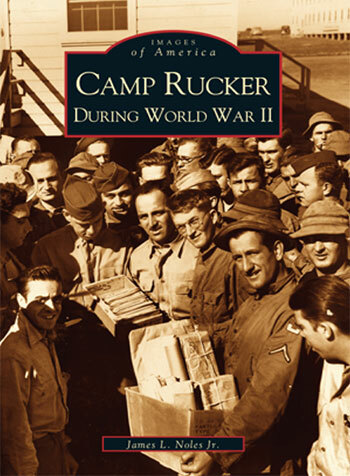 Book (series “Images of America”) related to Camp Rucker during World War II. Written by James L. Noles, Jr., Arcadia Publishing, 2002 (the cover illustrates mail call). The 313th Station Hospital was officially activated at Camp Rucker, Ozark, Alabama on 29 March 1943. The 313th Station Hospital was originally activated as the 10th Hospital Center, 25 June 1942, at Camp Rucker, Ozark, Alabama (Division Camp. Overall acreage 58,999; troop capacity 3,280 Officers and 39,461 Enlisted Men –ed) with a cadre of 1 Medical Administrative Corps Officer and 22 Enlisted from Lawson General Hospital (named after Surgeon General Thomas E. Lawson, 1793-1861, designated General Hospital by Letter AG 322.3 General Hospital 1-9-41 M, Ret M-C, 11 Feb 41, wood cantonment, open 22 Jul 41, 2514-bed capacity, specialties neurology, amputations, neuro-surgery, deep x-ray therapy, closed 25 Jun 46 –ed), Atlanta, Georgia. As of 31 March 1943, the unit’s strength consisted of 17 Officers, 1 Nurse, 3 Warrant Officers, and 227 EM. Effective 1 April 1943, and in compliance with instructions contained in War Department Letter AG 320.2 (3-11-43) OB-I-SPOPU-M, Subject; “Redesignation and Reorganization of Certain Hospital Centers and Bands”, dated 15 March 1943; Letter Headquarters, Fourth Service Command, Atlanta, Georgia, File AG 320.2 Medical, Subject as above, dated 24 March 1943; and Paragraph 1, General Orders No. 7, Headquarters, Camp Rucker, Alabama, dated 29 March 1943, the 10th Hospital Center, less band, was reorganized in accordance with Tables of Organization 8-560 (column 17), as a 750-bed Station Hospital, and redesignated the 313th Station Hospital. 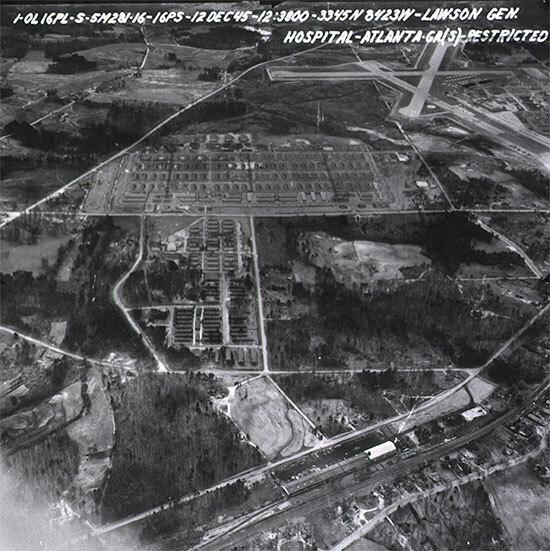 Aerial view of Lawson General Hospital (picture dated 12 Dec 45), Atlanta, Georgia, which furnished the initial cadre to help organize the 313th Station Hospital. Lt. Colonel I. H. Sonne, assumed command of the 313th Station Hospital as of 20 April 1943 at Camp Rucker, Alabama. Under his direction the unit was given a rigid period of training and preparation for overseas service, as outlined in MTP 8-1 (Mobilization Training Program, dated 23 Feb 42) and MTP 8-10, supplemented by applicatory training of personnel in the Camp Rucker Station Hospital, Alabama. For medical units activated on or after 25 September 1943, a new Mobilization Training Program, MTP 8-101 (dated 1 Sep 43) was to be used. The purpose of the Training program was intended to furnish a general guide for a balanced Basic Training of Medical Department units so that they could be prepared to receive further training in the Technical – Tactical – and Logistical functions of the hospital unit and the duties of personnel assigned to the unit. 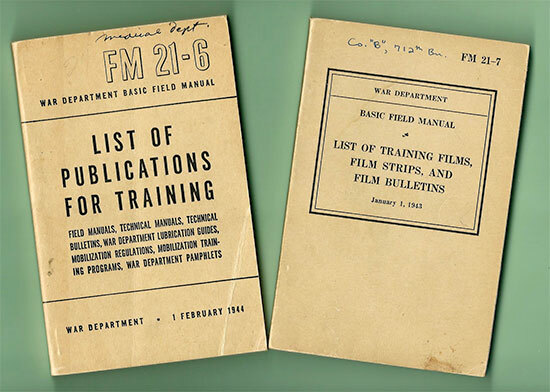 In addition, it was recommended to consult the most recent editions of FM 21-6 “List of Publications for Training, Including Training Films and Film Strips”, and FM 21-7 “List of Training Films, Film Strips, and Film Bulletins”. Normally, Field and Technical Manuals, Army Regulations, Training Circulars, Training Films and Film Strips contained sufficient instructional material for training purposes. In general, the Training program was conducted in accordance with the doctrines prescribed in FM 21-5 “Military Training”, TM 21-250 “Army Instruction”, and TF 7-295 “Military Training”.. The general Master Program consisted of a total of 572 hours; covering Basic Training, Technical Training, and Field Training. The MTP 8-1, which was mainly applied, covered a 13-week training program based on a 44-hour week. 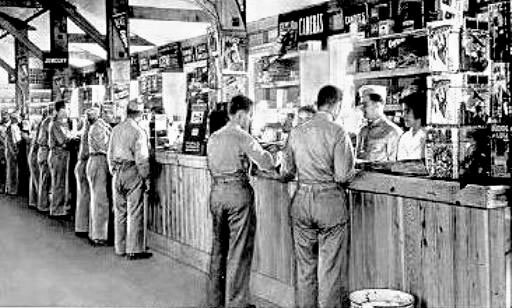 Picture illustrating one of the many Post Exchanges at Camp Kilmer, Stelton, New Jersey. The 313th Station Hospital transited via Camp Kilmer, one of the Staging Areas for the New York Port of Embarkation. 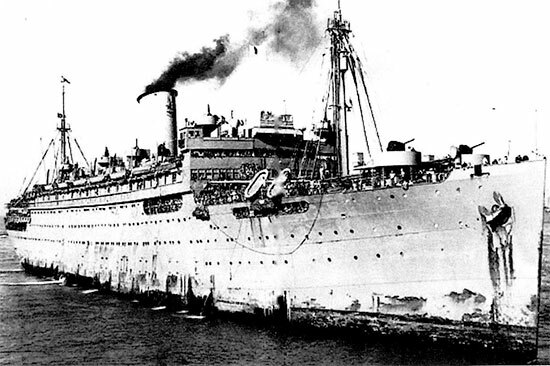 Late war picture of USAT (United States Army Transport) “Brazil” which carried the 313th Station Hospital overseas to the United Kingdom. Pursuant to authority contained in Letter War Department, Adjutant General Office, 20 November 1943, File WD 370.5 (19 Nov 43) OB-S-E-M; Letter Army Service Forces, New York Port of Embarkation, 8 December 1943, File SPTAA-P (CB) 370.5 (# 2907); and Paragraph 3, Special Orders No. 306, Headquarters, Camp Rucker, Alabama, dated 16 December 1943; with Lieutenant Colonel Irvin H. Sonne, MC, O-119609, Commanding, the 313th Station Hospital arrived in the United Kingdom 8 January 1944, debarking from the US Army Transport (USAT) “Brazil” at Greenock, Scotland, 1600 hours, and proceeded by rail to Fremington, near Barnstaple, North Devon, England, arriving there at 1725 hours, 9 January 1944. 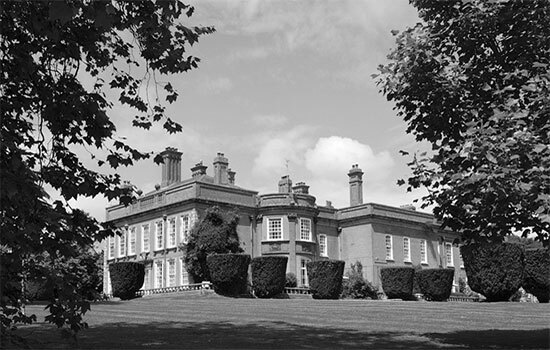 The 750-bed Station Hospital was established at Fremington, Devonshire, England. The organization arrived in England with full strength, as provided by T/O & E 8-560, dated 22 July 1942, consisting of 40 Officers – 75 Nurses – 2 Dietitians – 1 Physio-Therapy Aid – 3 American Red Cross Workers – 1 Warrant Officer – and 392 Enlisted Men. The vehicles authorized by the T/O & E included 6 Ambulances – 1 Passenger Car – and 6 Trucks. The unit had been divided into the various professional services and administrative offices during the training period conducted in the Zone of Interior, therefore only minor changes in principal and additional duties were necessary in staff and personnel for efficient operation of the Hospital. Picture illustrating some of the Field Manuals used during Training by the 313th Station Hospital. The Post was situated within marching distance (less than 1 mile) from the railway station at the Quay and approximately 3 miles west of Barnstaple, Devonshire, England, APO # 553. A three-story brickhouse, approximately 200 years old, known as “Fremington House”, was used as ANC Officers’ quarters and an Officers Mess. Unfortunately the third floor (upper) of the building could not be utilized for quarters as it lacked a fire escape or emergency exit. The second floor accommodated 52 Nurses in 4 large rooms and 6 smaller rooms (formerly the billiard room). The first floor constituted the Officers Mess, which included a large kitchen, a dining room, a lounge, a lobby, a library, as well as several small rooms. Four small plasterboard buildings were temporarily used to quarter the balance of the Nurses and women attached to the organization. Officers and Enlisted Men were housed in Nissen hutments, accommodating between 5 to 16 men each. These constructions, bricked up at each end, and containing 2 windows and a door at either end, formed a half-barrel building. A coke fire stove was installed in the center and furnished adequate heating facilities. Ablution buildings were conveniently located a short distance away from the Nissen huts. Three separate Messes were operated: Officers Mess – Patients Mess – and Detachment Mess. Food was prepared on coal-fired ranges and then placed on serving tables, where soldiers could help themselves. Special attention was given to the conservation of food and orders put in effect that whatever food was taken on the plates, was to be eaten. Due to a shortage of lumber, some difficulty was experienced in the beginning with providing storage bins; nearby Engineer and US Navy units, were contacted, and packing cases were thus obtained and transformed into bins. All rations were obtained from Woolacombe, North Devon. Functions of the 313th Station Hospital during 1944 consisted in providing hospital services to units training in the locality, and more specifically the “Assault Training Center”, located at Woolacombe, Devonshire (the ATC was set up by Colonel Paul Thompson, CE , starting in June 1943 –ed) where numerous US units were training for the Invasion of the Continent. Partial view of “Fremington House” (3 miles west of Barnstaple), Fremington, Devonshire. The 3-story brick construction was used for quarters and messing by the ANC Officers assigned to the 313th Station Hospital. Hospital Plant # 4121 located at Fremington, Devon, was being operated by the 110th Station Hospital, a 250-bed unit, when the first command personnel arrived. Lt. Colonel I. H. Sonne, MC, assumed command of the 313th Station Hospital, effective 2359 hours, 14 January 1944. At that particular time 7 wards were in operation, with 167 patients receiving treatment. Work was immediately begun to increase the bed capacity from that of a 250-bed to a 750-bed unit. As of 31 March 1944, a total of 24 wards were in operation, or ready for operation, with 263 patients in the Hospital, and the necessary equipment on hand whereby all available wards could be placed in operation should the occasion arise. Extra plans were formulated and sites selected for additional expansion under tentage and in existing temporary buildings in the event of an emergency. One of the first problems undertaken was the elimination of mud. Only some concrete roads and walkways had been installed. Adequate draining was lacking, resulting in muddy water flooding the roads and walkways. As a consequence of this, mud was often brought inside the wards and various administrative buildings. Considerable time was spent in installation of drainage ditches and piping, and leveling the area generally, in addition to construction of additional roads and walkways. An acute shortage of manpower was experienced, primarily due to the fact that the organization was operated as an independent Post. Consequently, it was necessary to organize and install a guard detail for the proper protection of Government property, supply personnel for the operation of a Post Exchange, a tailor shop, a barber shop, a telephone switchboard, etc., in addition to extra details required for policing the grounds, opening new wards, and other routine duties. Tables of Organization made NO provisions at all for personnel to operate the first four services named above. A further study was started on this subject and every effort exerted to utilize the available manpower where maximum efficiency could be obtained. 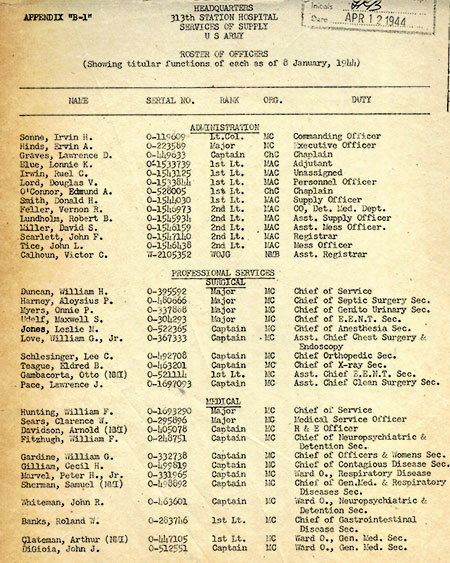 Copy of vintage document indicating Roster of Officers showing their individual functions as of 8 January 1944. Only part of the Administrative, Surgical, and Medical Services are provided. One (1) Medical Officer was lost by the unit due to illness. Several Medical / Surgical Officers and Army Nurse Corps Officers were sent to attend special Schools in the United Kingdom, and upon their return they instructed other members of the command regarding current procedures used in the ETO. As a whole it can be stated that morale was excellent. Hospital members realized the seriousness of the job at hand, and therefore the long working hours required in getting the Hospital up to the required standards left little time for recreation. All forms of athletics were encouraged as it benefitted physical effectiveness. There was an excellent basket ball team, which won 9 games out of 11 (between 8 January and 31 March 1944). Two (2) volleyball courts were built and more planned. Permission was requested for the use of an adjacent field to construct a base ball diamond. A temporary building was reserved for boxing classes. The organization contained sufficient musical talent to furnish a dance orchestra but was without instruments. Contacts with Special Service Division were made but no instruments were obtained in the period described. Arrangements were made for a weekly showing of motion pictures, successfully handled by 1st Platoon, 30th Special Service Company, quartered on the Post. “Liberty” passes were obtained and truck transportation made available for bringing personnel of the command to Barnstaple, three nights weekly. School lectures were concluded on 23 April 1944, at which time a final examination was given to determine the students’ proficiency. A majority of the EM were able to qualify as cooks. A meeting of the CO with Enlisted Men was held on a weekly basis, at which time pertinent information was disseminated and common problems discussed. Also, a suggestion box was placed in the Post Office where EM could register whatever queries and complaints they had or get their “gripes” off their chest. A Committee of 3 Officers and 2 Nurses was appointed to foster better Anglo-American relations, and numerous contacts were made by this Committee with British civilian and military organizations. Meanwhile, Enlisted personnel were encouraged to accept hospitality of British homes. Shortly after assuming command of the newly-set up Hospital, inspections took place by higher Headquarters with a rating of “unsatisfactory”. Effective measures were henceforth introduced and subsequent inspections soon brought reports as “excellent”, with certain Departments receiving superior ratings. Even though the 313th spent one and one-half years of training while still in the Zone of Interior, additional training was carried on after arrival in the UK. Plans were worked out and test runs executed on the Disposition and / or Receiving of large numbers of patients. Regular reviews were held on first-aid, treatment of gas casualties, protection against chemical warfare, aircraft recognition, fire fighting, etc. Preparing for D-Day; landing exercises conducted in Devonshire prior to Operation “Overlord” (6 June 1944); 2 1/2-ton cargo trucks move in reverse onto waiting landing craft, at berth near the training beaches, North Devonshire. No geographical changes were made during this additional period, with the 313th Station Hospital still located at Fremington, Devonshire, England, where it operated Hospital Plant # 4105. Lectures’ duration represented 1-hour each and consisted both of demonstrations as well as discussions of the different subjects. Although all personnel had received repeated training in these subjects, a review was indicated. All classes were completed by 11 May 1944. For sports and recreation, the 313th Sta Hosp had its own programs. Base ball and soft ball teams were very active, playing a game each week, and organizing exhibition games during the “Salute the Soldier” weeks in nearby English towns. On 23 April 1944, for recreation and out of friendship to the local population, the organization presented a variety show consisting of songs, music, and magic at the Strand Theater, Bideford, North Devon, England (an institution open to all soldiers in the vicinity –ed). The same show, presented by the 313th, was later given to patients and Enlisted personnel of the Hospital. Through special arrangements with the American Red Cross at Bideford, several musical instruments were finally obtained, which would serve as a nucleus of a complete dance orchestra that developed into a seven-piece combination. The unit’s musicians were now able to furnish music for the weekly ARC dances at Bideford as well as dances organized within the Hospital buildings. Two dances per month were held on the Post for the EM, to which many a British WAAF and other servicewomen were invited. Pictures illustrating pre-Invasion Exercises in Devonshire. Left: Unloading a 2 1/2-ton cargo truck at a concrete LCT (due to a shortage of landing crafts, rough concrete models were built, enabling vehicle drivers to train properly for loading and unloading). Right: M-4 Sherman reversing onto a waiting LST. Of special interest is the armored vehicle’s deep wading gear. During May, previously-made plans for the pitching of ward tents was executed. Concrete slabs were obtained and prepared from British sources and laid as flooring. Thirty-two (32) with a capacity for 480 patients, were so placed between the permanent structures that personnel assigned to these structures would be able to care for the extra patients placed under tentage should the necessity arise. 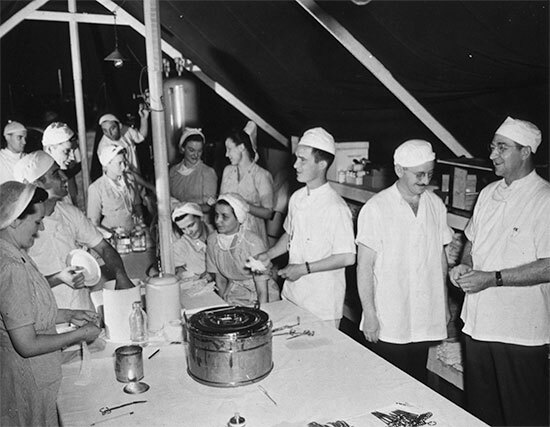 Stoves and beds were also prepared in the tents and made ready for instant use in the event of an emergency. On 6 May 1944 approximately 100 Officers, Nurses, and Enlisted Men, participated in a parade at Bideford in connection with “Salute the Soldier” week. The ANC Officers, on their own, paraded once more in Barnstaple, on 8 May 1944 in relation to that town’s “Salute the Soldier” week. Those in charge of arrangements for these social affairs were very complimentary with regard to appearance of the command personnel in these parades and it was believed that such activities greatly enhanced Anglo-American relations and friendships. The local population was especially impressed by the participation of the ANC Officers. On 25 May 1944, word was received from the Chief Surgeon’s Office that a Hospital Train would deliver approximately 285 patients to this Hospital, coming from the 314th Station Hospital (Hospital Plant #4100 –ed). SOP on the admission and reception of patients had been worked out previously, therefore there was little confusion in making the necessary preparations for this operation (it was the unit’s first Hospital Train –ed). Sufficient motor transportation was made available within the organization and all the patients were successfully evacuated from the Hospital Train in one and one-half hours. In total, 248 patients were received. On 6 June 1944, 200 patients were received by Hospital Train from the 115th Station Hospital (Hospital Plant # 4101 –ed), and evacuated in only forty minutes, indicating that errors made in the initial evacuation had been corrected. A Central Supply System was put into operation at the 313th. Originally there were only 2 autoclaves used for this service. A small sterilizer, an instrument sterilizer, bath tubs, a washing machine, etc., were gradually installed in a building adjacent to the boiler room, which was centrally located to both Surgical and Medical Services. A storage room was organized for the safekeeping of sterile IV sets, blood donor sets, aspiration sets, surgical sets, dressings, gauze, applicators, tongue depressors, and other instruments. All instruments and drapes used by the OR staff were made up and sterilized by this Section. Decontaminators were also installed for the proper treatment of mattresses and blankets. Reserve oxygen tanks were equally stored in this building. The new service was inaugurated for the purpose of simplifying the distribution of surgical supplies and dressings throughout the entire Hospital. The Rehabilitation and Convalescent Training Program was greatly improved during the period April – June 1944, primarily due to increase in the length of time units of this size were permitted to retain patients in the Hospital. Six (6) unused temporary buildings were allocated to this special service and convalescent patients were effectively encouraged and utilized to dress these buildings up, landscape the surrounding grounds and install walkways. This outdoor exercise and work had a definite advantageous effect that it conditioned the men (read patients) sufficiently to prevent recurrence of their infections upon return to full field duty. The convalescent patients were also given calisthenics, organized athletics, and hikes, in addition to lecture classes on current military events, and discussions on “Army Talks”, and other material. All available unused ground in the Hospital area was used for the expansion of the British Agriculture Program. The area proper was farmed by 2 British servicemen under supervision of the Devon Branch of the British Agriculture Program and the unit’s Mess Officer. The 313th Sta Hosp used as much of the produce from this area as possible. The cultivated grounds consisted of ten acres, five of which were planted with potatoes, four acres which contained assorted vegetables, and one acre of fallow ground. Picture illustrating some of the 313th Station Hospital personnel attending Cooks’ School in England. Weekly Training Programs continued throughout the quarter. Open discussions were held on various subjects covered in “Army Talks”; all phases of handling gas casualties, gas decontamination, neutralization of gassed areas, were given careful consideration, and a gas alert took place weekly. Physical and field training were allotted 8 hours on a weekly basis. Medical and Surgical Technicians received 2-hours weekly on oxygen therapy, use of Plaster of Paris, and Wangenstein suction. Additional training was provided by sending medical personnel to other places. During the period April – June 1944, 4 Medical Officers were detailed on DS with other units in the region. Also 1 each from the Dental Corps and the Medical Administrative Corps. Three (3) more Medical Corps and 1 Dental Corps Officers were evacuated and lost due to illness; and 2 Medical Corps and 1 Dental Corps Officers transferred elsewhere. Finally, 3 new Medical Corps and 2 Dental Corps Officers were assigned to the unit. 1 July 1944 found the 313th Sta Hosp still established at “Fremington House”, 3 miles west of Barnstaple, Devonshire, England. During the early part of July, Captain J. A. Sterling, MC, a representative from the Office of the Chief Surgeon, ETO, inspected the Post, and explained the new Program of Rehabilitation as conducted by the 77th Station and 307th Station Hospitals. He informed the command that approximately 500 patients would be transferred from the 307th Station Hospital to the installation within the next few days and advised certain important changes in the Hospital and its personnel to accommodate these patients. On 16 July 1944, 4 Medical Corps Officers were sent on DS to the 307th Sta Hosp for the purpose of study, orientation, and observation of Rehabilitation as conducted at that particular installation. On the same day, 2 MC Officers, 2 Infantry Officers, 10 PT Instructors, and 300 patients arrived at the 313th Sta Hosp, Fremington, Devonshire, from the 307th. A special program was immediately instituted, modeled on operating procedures and plans followed by the other Hospital. A patient / trainee Battalion of 4 Companies was subsequently formed, certain buildings evacuated, double-decker beds obtained or constructed. Fortunately, certain units in the area were moving at that time and these double beds, or materials for their construction, were hauled to the Post via motor transport. 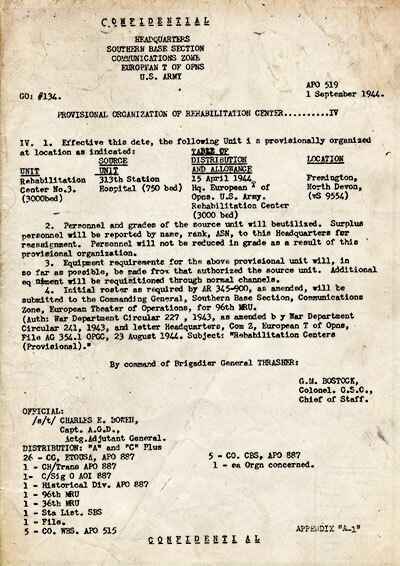 Copy of vintage document dated 1 September 1944 indicating the conversion of the 313th Station Hospital to a “Rehabilitation Center”. The aim of the Rehabilitation Center was to prepare convalescent personnel for further military service or for discharge (depending on the nature of the soldier’s disability). The patient was accepted from the Hospital where he was being treated as soon as possible after he had reached the convalescent stage. He was then subjected to a specific physical therapy or remedial exercises as well as general reconditioning and hardening, which reduced the convalescence period to a minimum and prepared the soldier to return to duty as soon as possible in a strong and able physical condition. His physical ability and mental attitude were important factors to complete his rehabilitation (average stay for a convalescent patient in a special Convalescent Center represented approximately 18½ days). The Rehabilitation Center tried hard to avoid any mental or physical deterioration of the patient that could occur while he was in the Hospital. The theory was that the longer he was hospitalized, the more permanent his deterioration became. The overall plan and program for the care, treatment, and general Rehabilitation of the patients always remained the same and its purpose was to return as many men as possible to fighting fitness in the shortest possible time. The Center’s professional services assumed complete responsibility for the medical diagnosis, treatment, physical rehabilitation, and review of basic military training for the patient / trainee. After the latter had been admitted, he was given a thorough medical examination at which time his admission diagnosis was either confirmed or revised and any necessary laboratory procedures or X-rays ordered. The patient was then placed in one of the 5 grades; the more physically fit were placed in corresponding grades “D” – “C” – B” – and “A” respectively, while the least physically fit were placed in “E” grade, which were then formed into grade Companies. In each grade the patient / trainee was required to perform a specified amount of physical activity and remedial exercises to improve his condition, which would allow him to move on to an improved and higher grade. The month of August would bring an important period of changes for the 313th Station Hospital as it was planned for the unit to open for admission of convalescent patients starting at 0001 hours, 10 August 1944. The Hospital had meanwhile been partly reorganized as a convalescent facility, now redesignated and opening as Rehabilitation Center No. 3 (however still based at Fremington, Devonshire, APO # 872 –ed). On 14 August 1944, 4 MAC Officers visited the 307th for observation of administrative procedures related to the Rehabilitation of convalescent patients. On 17 August 1944, a temporary T/O & E (intended for 1000-bed and 3000-bed Convalescent Centers, was approved 23 Jun 44 –ed) was drafted for the Hospital (and others being converted to the Rehabilitation Program in the United Kingdom –ed). The Hospital bed space was reduced to 8 active wards (numbering approximately 300 beds), which seemed necessary to keep in active operation in view of the patient census at that time and the current admission rate. It must not be forgotten that the 313th was still servicing local troops as an active Station Hospital, and an active Medical and Nursing staff was required to do so. A Professional Service Chief was appointed to coordinate all Medical and Surgical Services, Outpatient Clinics, Rehabilitation Section, and all other professional services used by the command. In order to support the Rehabilitation Program, the original patient / trainee Battalion was expanded to a complete Regiment, 2 Battalions of 4 Companies each organized, with a third Battalion in the making (operational during September), as of 31 August 1944. The administration and the training program for the new Rehabilitation Center was conducted according to military administration of an Infantry Regiment. 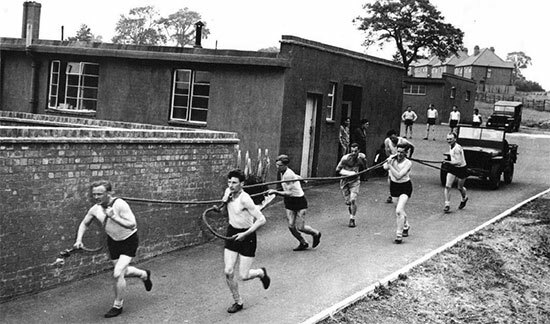 Convalescing US troops tow a Jeep using heavy-duty rope as part of a Rehabilitation Program in the United Kingdom. No awards or citations took place for members of the command during the described period. Award of Purple Heart medals was made to 18 patients / trainees in this Hospital on 26 August 1944 who had not previously been awarded same. By the end of August 1944, a total of 1846 patients / trainees had been received over a period of forty-five days. The rapid expansion of the Hospital’s Rehabilitation Section and the contraction and consolidation of the actual Hospital Section necessitated extreme efforts of all personnel concerned to bring about this conversion and continue to maintain the necessary standards of medical, nursing, training and administrative care. It was now definitely determined that the 313th Station Hospital would be officially redesignated Rehabilitation Center No. 3 with a capacity of 3000 beds. During reconversion to a Rehabilitation Center there was a marked shortage of transportation, the organization had on hand only 2 cargo trucks, 3 weapon carriers, and 6 ambulances. A fifteen-mile trip was involved for obtaining mess supplies; requiring the use of 1 truck and 1 weapon carrier. Before the end of September, the distance was increased to fifty miles. The necessary material for the construction of double decker beds, the gymnasium, the obstacle course, and many other necessities used for the Rehabilitation Program were obtained as far afield as hundred miles; often calling for the use of all available motor transport or vehicles on loan from nearby units. General Orders # 134 were published on 1 September 1944 by Headquarters, Southern Base Section, Communications Zone, European Theater of Operations, APO # 519. They confirmed the provisional reorganization and conversion of the 750-bed 313th Station Hospital (source unit) into the 3000-bed Rehabilitation Center No. 3. These official orders permitted the requisitioning of additional transport, with final receipt of 3 additional cargo trucks, 2 weapon carriers, and 3 (British-built) buses which helped overcome the transportation problem. There remained an acute shortage of clerks and typist for the administration, because of the increased medical, personnel, finance, admission, registration, disposition records, and Regimental, Battalion, and Companies commands. Permanent personnel of the command was therefore augmented by utilizing the services of patients / trainees, on a voluntary basis, in order to maintain medical records and other administrative activities on a current basis. By anticipating the turnover of patients / trainees it was believed that sufficient trained clerical personnel could be maintained, without detriment to the individuals involved. Two adequate buildings were designated for remedial gymnastics. Requisitions were submitted for equipment and furnishings but a very limited and meager supply was received. Through ingenuity, begging, and aggressiveness of the Physical Training Instructors and Officers concerned, the gymnasium was partially fitted with improvised equipment. The 10 PT Instructors who had arrived with the group of patients on 20 July were too few for the demand, consequently a training class for Instructors was conducted during the month of August 1944 and additional PT Instructors obtained. An investigation by Engineers and Hospital Architects was made with regard to sewage disposal and water supply for the Post. It was concluded that housing, water and sewage disposal now supplied were adequate for 2500 overall personnel. This was only made possible by the establishment of a controlled conservation plan of water consumption and regulation of sewage disposal (this would prove difficult to implement –ed). The Physio-Therapy Section was considerably expanded to expedite the function of this important department in Rehabilitation work. It originally only consisted of 1 Officer supplemented by 3 EM. Due to the program, 1 additional Physio-Therapy Officer, 2 Nurses, and 2 Enlisted Men were assigned which was quite an improvement. The month of September 1944 witnessed the complete transition from Station Hospital to “Rehabilitation Center”. Definite progress was made with respect to organization and function, with Admission and Disposition rates and statistics favorably comparing with those of other similar institutions. As of 30 September 1944, a total of 3147 patients / trainees had been received, with 1163 dispositions; 764 of which returned to general duty; 143 to limited duty; 57 returned to General Hospitals for additional treatment and disposition; and 199 transferred to the 314th Station Hospital to form a nucleus of Rehabilitation personnel at that installation (this Hospital was eventually converted to Rehabilitation Center No. 4 –ed). Following the increased flow of patients from continental operations, the site where the Rehabilitation Center No. 3 currently operated proved unsuitable and Fremington was therefore only used on a temporary basis. A more suitable installation site was finally obtained at Warminster Barracks, Warminster, Wiltshire, which opened after some adaptation works on 21 December 1944. By end of December 1944, five (5) Station Hospitals had been disbanded and converted to Rehabilitation Centers. On 3 February 1945 the 834-bed 348th Station Hospital relieved the 313th Station Hospital at Fremington, Devonshire (this new Hospital officially closed as of 2400 hours on 9 March 1945 –ed). 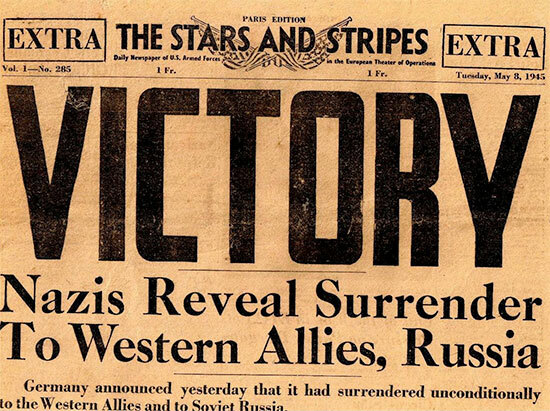 Copy of vintage Stars and Stripes, Paris Edition, dated Tuesday, 8 May 1945, announcing V-E Day. Between December 1944 and June 1945, the Rehabilitation Division, United Kingdom Base, had trained 138 extra Officers and 585 Enlisted Men. By 6 June 1945, all Convalescent Centers operating in the United Kingdom had discontinued operations and disposed all their patients / trainees. They were now reorganized to serve as staging area for redeployment to the ZI, with personnel being selected and prepared to maintain a convalescent capacity for the United States Occupation Forces in Germany. The MRC Staff are still looking for additional data relating to the 313th Station Hospital’s final operations in the European Theater of Operations, and the unit’s inactivation and / or transfer to Germany for Occupation duties. All inputs appreciated.